Every time someone visits your website a server somewhere needs power. More often than not that power comes from a “dirty” electricity source. Websites now produce a huge chunk of global greenhouse gasses. Over a year we’re potentially talking tonnes of pollution into the atmosphere for each website that goes online. But there is good news: we can cheaply and effectively offset this carbon and make our websites much greener. This post is designed to be a starting point for your own research and maybe a trigger for you to take some small action. Together we can make a difference, so please consider sharing it around. Why is Blog Tyrant writing about this? We all know that the environment is in trouble. It’s been in trouble for a long time and, while there are some important breakthroughs, it seems like the progress is all too slow. This documentary “hints” at that. Although the science has been settled for ages now, there are still politicians and private companies who use misunderstandings and half-truths to muddy the issue and confuse people. Some examples of this are seriously shocking. As online business owners, we tend to think of ourselves as being pretty green. After all, we’re not driving trucks around or cutting down trees for palm oil, are we? Unfortunately, however, our websites add to global pollution by having servers that are usually powered by either a mix of clean energy and dirty energy, or just dirty energy alone. In fact, the IT industry now pollutes just as much as the airline industry. – Tweet this. Seeing as Blog Tyrant helps a lot of people start blogs and build traffic, I’ve decided to step up and use some of my money and skills to offset my own impact, while also encouraging others to do the same. Fortunately, it’s quite cheap to make a big dent. If everybody who reads this post spends even $10 offsetting some carbon we’re talking about thousands and thousands of tonnes of pollution out of the atmosphere. What an amazing thing to do! I’m really hoping you guys are down for this. Get more tips on how to make your website carbon neutral here. Please consider sharing this graphic on social media or feel free to grab the code above and embed it on your own blog (I don’t care if you remove the links, they’re no_follow anyway). Getting the word out there is one small way we might be able to make an impact. Now let’s get into some details, facts and stats. So, how much does a website pollute? Before I get into some of the solutions I thought it would be useful to take a look at how much pollution our websites and blogs are actually creating. Unfortunately, while researching this issue, I found it almost impossible to get a consistent estimate of how much carbon is produced on average per site visitor. I literally spent months investigating and couldn’t come up with a definitive and accurate answer – some companies involved in this area refused to elaborate on their methods, others didn’t publish any at all! We did publish an average formula early on but we saw some companies phrasing: “Our website emits X tonnes of CO2,” based on our formula. But in some cases it was a false number. So what we have done is evaluate around 1,000 websites and taken the average number of 50% of the most polluting websites. We have then made sure our total calculation of needed compensation is higher than this number. That way we are very sure – but we just do not want specific companies to put a number on their site. Not many companies were as forthcoming about their methods as Erik’s, and as such I haven’t mentioned them in the article. The more traffic a website gets the more energy is needed to keep it online and access it. The longer visitors stay on your site the more power their computers use. Larger PCs are more inefficient than laptops, for example. Some servers are more efficient than others, and some companies purchase carbon offsets. Some countries/states now have a percentage of renewable energy in their power supply. Readers in these locations will thus produce less carbon. All of these things will impact that amount of energy that is required to power a website, but it’s impossible to be 100% accurate because there’s no way to know exactly what all of these numbers are. For example, we can estimate how much energy a visitor on a PC will use to read your blog for five minutes, but if that reader has a massive 3-screen gaming rig then the CO2 is going to be significantly higher than average. So how do we assess our own website’s pollution? We need to rely on averages/benchmarks used by trusted organizations that are involved in the business of offsetting carbon around the world by supporting green projects. On our website you can find the calculation behind the carbon offsetting, and our carbon offsetting is audited independently by the globally recognized accounting firm Deloitte. You will find that we compensate with many buffers in our calculations. So, in the end, our CO2 reductions are more than the emissions from the use of the websites. This is our decision as we want to be very sure that our participants in total deliver on their message, that they are CO2 neutral. At this stage it seems like it’s only possible to get a very rough estimate about a website’s carbon emissions – but I’m starting to think that is okay as long as firms like Erik’s are making trustworthy compensations. Looking elsewhere, I found Carbon Fund has a great breakdown of how they calculate their offsets while this website calculated 1,000 visitors a day be to around 2,160 kilograms (4,761 pounds) of CO2 per year. Other websites, however, indicate that this figure might be a little high. Personally, I’m comfortable looking at a range of figures from a variety of sources and then assuming that my website is worse for the environment than it might be in reality. I think it’s better to err on the side of caution when it comes to climate change, especially as the offsets that we can purchase are relatively inexpensive. I’ll show you what I decided to do for my business below. You don’t need an exact number of CO2 output in order to do something and, luckily for us, we don’t have to go out and plant trees ourselves! What we can do is pay a reputable organization to invest in green projects on our behalf. There are literally hundreds of amazing projects around the globe that have been specifically set up to help companies offset the damage that they do. 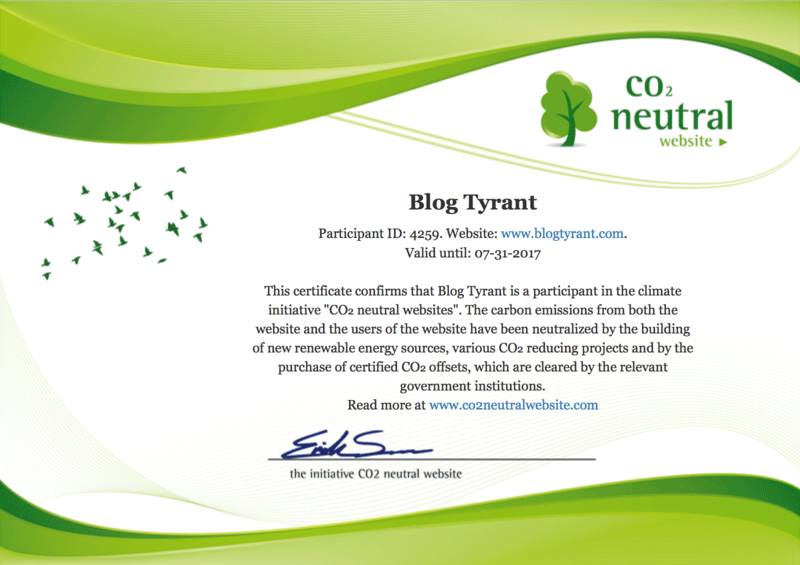 After researching the options available I decided to go with CO2 Neutral Website as a good starting point for making my website carbon neutral. I then decided to engage the United Nations online platform for voluntary cancellation of certified emission reductions (CERs) in order to ensure that I am well and truly offsetting more than I am producing. 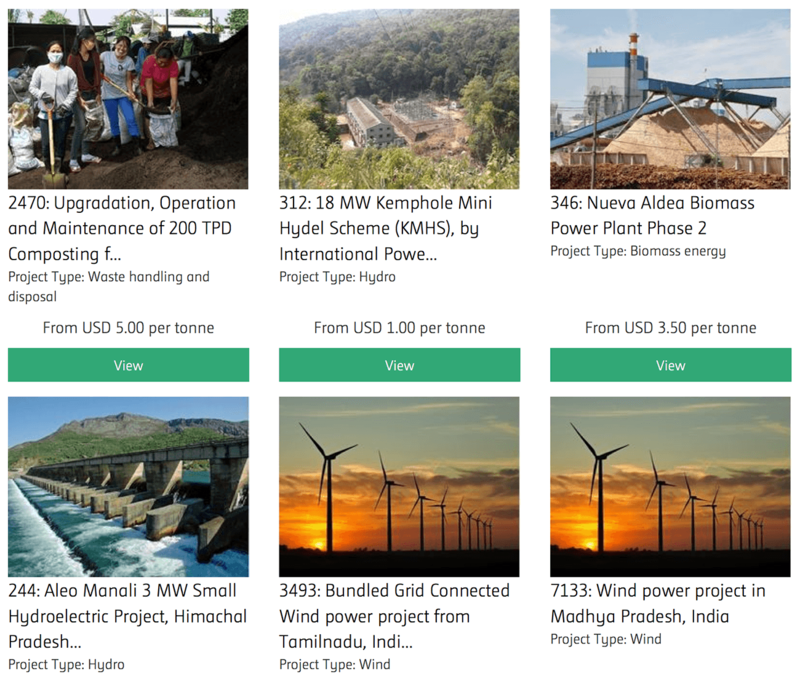 This website allows you to invest in and support wind, solar, hydro, re-forestation, etc. at a very low cost. These projects work by canceling carbon credits so that you’re effectively taking a tonne of pollution off the table for every credit that you buy. They also have the added benefit of being beneficial to the local communities where these projects take place – a lot of them in developing countries. 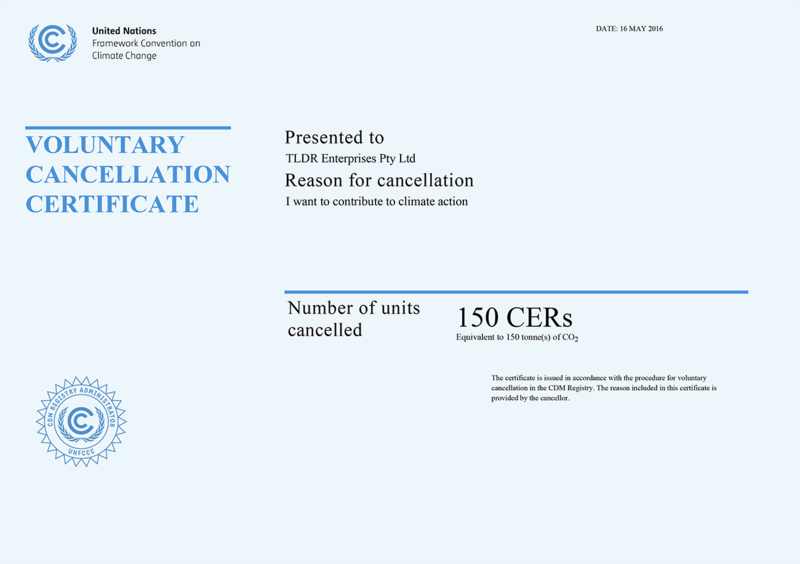 Each time you purchase you get a certificate of the cancellations. I decided to purchase offset cancellations for 150 tonnes of CO2 here as a starting point for my research. This cost around $150 and was focused on wind projects in India. I’ll continue to do this each month as I feel like it is a good way to spend some of the money that my company produces, and has become a regular part of our charity donation mix. So, what can I do next? If enough people share this article we can get some traction on social networking sites and then, hopefully, get in front of more influencers who can then push it further. A quick Facebook post could go a long way. As far as I can tell, this is a really good place to offset some carbon and spread the world by placing a graphic on your website that says you’re carbon neutral. If you can’t afford it (maybe take a look at some ways to make money online as well) then move on to the next option. 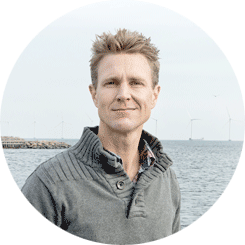 Use the United Nations online platform for voluntary cancellation of certified emission reductions (CERs) and pledge to keep making small donations here and there when you can. Other companies like Solar Aid help fight climate change by selling solar lamps and chargers in Africa so as to prevent the use of kerosene lamps and dirty home generators. This also has wonderful benefits for the community and is cheaper to donate. Some hosting companies benefit the environment by purchasing carbon offsets and using efficient cooling processes, others do absolutely nothing. Email your web host’s management and put polite pressure on them to step up on their commitment to climate change and purchasing offsets. Customer pressure is a big impetus for corporate change. Think about all the cloud-based services you use each day. Your mailing list storage, file sharing like DropBox and iCloud, entertainment like Spotify and Netflix. As paying customers of these services you have a voice. Get on public social networking sites and ask what they are doing to address their carbon footprint. Quick tip: Donations to these types of organizations will sometimes be tax deductible depending on your local tax laws. Talk to your accountant and see whether you are able to claim them or any portion at tax time. Going vegetarian halves your diet’s carbon footprint so if you do it even one extra day a week you’ll massively benefit the environment over your lifetime. Phone calls do a lot more than emails when it comes to government policy. Call your local members and tell them that a climate policy needs to be prioritized if they are going to win your vote. And make sure you vote accordingly. This is a huge economic, security and social issue we need to tackle. Most energy providers now allow you to pay a slightly higher supply cost to get more of your electricity from renewable sources. As more people do this more money will go into those projects and costs will come down. Ring your provider and ask what’s available and if it’s not, switch. You’ll get a good deal. Do you really need that iPhone 6s+ when you’ve already got the 6? Do you even really need to upgrade every time your phone plan allows for it? The carbon emissions required to make something new (like a phone, laptop, PC, car, TV, etc.) are astronomical, far higher than the actual emissions associated with running the thing. I got rid of my massive gaming rig PC for a laptop, and have run my online company from two laptops in a decade, and one of those was second hand. I don’t need the latest. These are just the tip of the melting iceberg – there are so many things we can do in our day to day lives. As I said at the top of the post, I’m just hoping this article serves as a starting point. Will you get on board? If you feel inspired to take some action for your own website then why not leave a comment below and make it public? I think it could be really inspiring to see that other people in our community making websites carbon neutral. In fact, I’m excited about it! I’m lucky enough to be able to spend some of my income on offsets and related charities. I’ll continue to do that while also promoting this article to try and get as many people on board as possible. Hopefully it’ll have some small effect. Please share this post around and let me know your thoughts below. I have a deep sense of respect for you, and it only increases. I have never seen things from this angle till now. For a moment, I felt guilty about being a blogger – maybe I was overthinking. Most of the time, I play my part. And I do a lot. There a hundreds of other things I do. I try in all the ways I can. However, this issue is far serious than it seems (I’m imagining the size of the internet while typing this). We need some fundamental changes. Why don’t the servers use renewable energy resources? Isn’t there any less harmful way to keep the Internet working? Perhaps, a some discussions may not be enough to solve it – but I’m sure they will create a lasting effect gradually. But I’m just hoping that everyone starts considering the effects of their actions on the environment. To me, this post is revolutionary, and you’re a pioneer in something like this. I don’t think there is any need to feel guilty, we just have to do our best and be open to making changes when we find out new information. This is right up my alley, since my website is all about being green and eco-friendly. Here I was polluting the earth anyway! Yeah, it shocked me as well. Just another thing we have to raise awareness for, I guess. Ashley, I’m adding your website to my Healthy Planet Resource Page, also. This resource page is getting out of hand, LOL! Has Blog Tyrant written any posts about how to create an awesome resource page? I’m going to google that. Why thank you Laura! You are sweet, I’m not sure if he has or not! 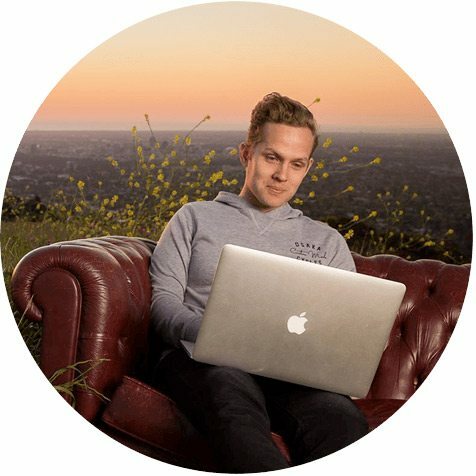 He’s written about a lot of subjects though when it comes to blogging! 🙂 I have you under the “Diapers” heading. This is a great article! I have hardly given a second thought to the energy consumption (and subsequent harmful production) of online activity; I appreciate being educated more about this. I’m definitely interested in adopting this practice myself, thanks for working to improve your own footprint and others’ as well! Passing this on to friends for sure. Such an important article! Thank you for conducting all this research and presenting it in such an accessible way. Definitely something I will implement on my fashion blog ASAP. The fashion industry is always one of the last to adopt any responsible and sustainable changes, so this could be something great to share with other bloggers. Great stuff. Glad you mentioned the ‘offline’ things too. Can I recommend you change ‘vegetarian’ to ‘vegan’ though. Animal agriculture – including dairy and eggs – is devastating to the environment. As well as the emissions, it also contributes to shortages of fresh water, land destruction and deforestation, air and water pollution, soil erosion, loss of habitat and acid rain. Very good point. I’ll look into it. Represent! I’m vegan to0 and its pretty easy and healthy too. The Australian dietician’s page have also included vegan alternatives in their food wheel. Before I read this can I just say I love how you made everyone who opens that email click the link by not telling us what the post is about. If using scheduled posts how do you recommend sending newsletter updates? Hi Sam. How are you? Glad you liked the email. I wasn’t sure what approach would be best. Honestly, I don’t schedule posts just because I like to be online and reply to comments, make sure nothing breaks, etc. So I might not be the best person to ask. I’ll try that as well actually. I’m fine, did ur leg heal? Nope, leg is buggered! Ha. I think the approach was brilliant – most people “shut off” when they see the words CO2. You did a good job. Unthought and un-touched topic. Thanks I won’t be upgrading my pc too much frequently. Passed around already. Looking into other ways to get involved. Thanks for helping and make us all aware. Thanks for this, Ramsay. Really important stuff and I’m so glad you’re saying it. I’ll be looking into some of the ideas you suggest. Thank you for writing this. I had NO idea! I write about spiritual awakenings, which for me included discovering all the unnecessary chemicals in our food. To discover servers are using coal for fuel is just as suprising! I love that you not only shed light on a problem but you provide several options. I’ll share this and look at the resources you provided. Who would’ve thought sitting on a couch with a laptop could be damaging? Outside of the EMF exposure, that is…. I’m glad you enjoyed it. Thank you. The topic of global warming is very close to my heart and I’m glad that we are covering it! The permafrost is starting to melt and of course when that melts it’s going to release a massive massive massive amount of methane, an amount that it has not been actually calculated! I suggest meat once a week same thing for dairy or less. And watch cowspiracy! it’s got some really great information. Keep up the good work. Great topic, great write-up, well done Ramsay for a bold article and writing about a topic which most of the bloggers don’t even care about. This shows respect for the environment and the world in which we all live. I will look into this and will contribute accordingly. Thanks for a nudge. Thanks for sharing your unique jaw-dropping perspective on how websites contribute to pollution and how we can offset it by becoming ‘carbon neutral’. I have never looked at my website this way, but I guess there isn’t any denying it either. Definitely sticking to my old phone for as long as I can. Looking forward to more enchanting posts. Great footprints for younger bloggers to follow. Will definitely look for your advice. Everyone was talking about how to get traffic, how to earn from a blog….. etc but this post about saving our mother earth made me a fan of yours. Keep it up. We’ll be back to normal stuff next week. I agree. I’ve been so busy writing about the environment that I hadn’t stopped to consider this. I like how you provide options that anyone can implement. I would like to provide a link to this post on my Healthy Planet Resource Page – if that’s OK. Awesome post! Thanks, Ramsay! 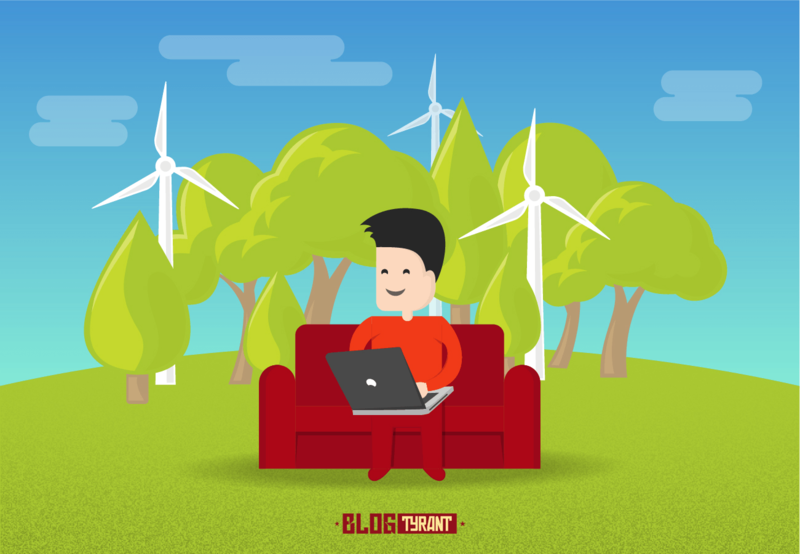 I think of myself as living pretty green, but smugly thought working from home, using the internet for business, was helping me create a smaller carbon footprint. I love that you have action steps we can all do, and I intend to share this article and follow through with some changes. From the angle of the web surfer, it seems we can make a dent there, too. Shutting down our browser, keeping fewer sites up while multi-tasking and watching the vampire energy consumption from all our devices… I need to get better at that! Maybe another article looking how web surfers can reduce their energy consumption would help reach even more people realize the power it takes to run this system. Great job! Keep up the good energy! Hi Ramsey I am from India and I am a passionate gardener.I love green living.This post is what makes this medium so powerful. I have tweeted and G+D .Now trying to sign up for a green account. A very important article for a very important time. Thanks Ramsay for giving the steps I can start doing right now to be a part of the solution. What a great informative article that is also sobering! Thanks for putting together this info and also providing some solutions that can be implemented immediately and also further researched. I also appreciate your heart. I hope it’s OK to leave a second comment. After having my morning coffee, I thought of something that might be helpful to others, especially those who use affiliate marketing. Because my blog is partly environment focused, I come across countless numbers of green companies while conducting research. Many of them go beyond selling green products; they actually use green technology in delivering their products and services. I’ve been astonished to learn that many of them have affiliate programs. I’ll be sharing a sprinkling of these in my next post about a specific product niche. I’m not taking on any new affiliates until my traffic grows, but you can bet I’ll be adding these companies to my marketing soup – at least with the ones that are relevant to my blog. As bloggers and website owners, we’re presented with an excellent opportunity to promote these companies that are making a difference. Wow, a lot of premises must be believed to justify the actions recommended. That any climate changed is the result of man is not settled science. The hockey stick function was found to be fudged and their science was manufactured also. The science does not point to man made global warming or climate change. I once believed we influenced the environment more than we do. In a micro environment we have a great impact for comfort and cleanliness but in the macro environment there is little to no evidence. Just using logic one would know the climate changes. there once was a great salt lake where now lies death valley, glaciers covered most of North America depositing granite outcropping and carving put lakes, dinausaurs once roamed that same nort America all these changes without an SUV or a Mack truck. Believing because everyone else believes is no excuse for going along, I believe you need to investigate your stand a bit more. Despite any of the science, don’t you think it’s a good idea to donate and be a bit more green anyway? I mean it’s not going to hurt anyone. Without a doubt we are having an impact on this planet. Now I’m not saying anything about climate change and whether it’s true/false. I’m just saying that we are having an impact so why not try to mitigate that impact a bit? Two of my best friends are climate scientists with PHds in various aspects of climate change, pollution, etc. and the effects it has not only on the weather but things like rainfall, disease, wars caused due to water security, etc. These are people who spend their life on this subject. And all of them are panicking. I’ll just reply to the first part of your comment: if you can find any credible scientists that are not worried about man made climate change I’d be very curious. Yes, some of them have made mistakes and errors. But, if 97% of scientists told me cigarettes caused cancer I’d stop smoking. Furthermore, the technology leading to green solutions is fantastic for the economy and has massive social and economic benefits. There’s really no terrible downsides that I could find. Thanks for commenting. I appreciate it. Hi Ramsay, I have been away and really don’t enjoy typing on a phone so excuse the delay. The problem I have is that climate changes. It always has. It always will. The theories of what might or will happen are based on computer models which can be helpful if all the data is unbiased, that is where the problem lies. Some data has been proven to be fraudulent, much like a high school lab project that doesn’t go the way you think it should. But, you have close friends that are very educated in this field ask them if there is fudged data out there, ask them if scientist are skipping data that doesn’t fit or collecting data that is artificially collected, I mean it’s a lot hotter near an active volcano than a shaded woods, both of which can be found in the same relative spot (Hawaii). Now, I like innovation. I like efficiencies. I like being open minded to facts, but, I will be treated as a fool. Example, your next comment by Jill Brock, I am wrong because he believes the explanations to be fact. No real debating there. I have no problem with an individual believing that some website tweak will help save the world, but, if you truly believe this, then turn off your air conditioner, don’t board that plane, turn off that flat screen, don’t use manufactured materials of plastics or metal, and then I’ll have a bit more respect. To answer your question I surf the web ::: “Will Happer is another, highly-respected physicist out of Princeton who compares the anti-CO2 crowd to the prohibitionists prior to the passage of the 18th Amendment. While he does acknowledge long-term warming, he thinks the influence of CO2 is vastly overstated, and that the benefits of a modest reduction in it will be negligible. The earth’s climate really is strongly affected by the greenhouse effect, although the physics is not the same as that which makes real, glassed-in greenhouses work. Without greenhouse warming, the earth would be much too cold to sustain its current abundance of life. However, at least 90% of greenhouse warming is due to water vapor and clouds. Carbon dioxide is a bit player. There is little argument in the scientific community that a direct effect of doubling the CO2 concentration will be a small increase of the earth’s temperature — on the order of one degree. Additional increments of CO2 will cause relatively less direct warming because we already have so much CO2 in the atmosphere that it has blocked most of the infrared radiation that it can. Thanks for taking the time to write that out. Similarly, if you have a read of the article I linked to at the start of the post (https://www.theguardian.com/environment/2015/jul/08/exxon-climate-change-1981-climate-denier-funding) you can see how many companies have been helping to create myth and rumor about climate science for a very, very long time, despite knowing the dangers. Honestly, I think this whole thing is akin to the tobacco arguments in the 50s and 60s. There are huge amounts of money at stake, and so companies and governments with vested interests choose to confuse people and drag their heels. The science may not be perfect, but to look at one or two bad studies and say that it nullifies the thousands of others that say similar things is madness. But, whether you believe in it or not almost doesn’t matter. The economy is changing. The world is moving towards clean tech and innovation. Countries like the US and Australia had a chance to lead, but are now probably getting left behind. How much have oil wars and so on cost the Western world? How much has it cost the people of the Middle East? Why wouldn’t we move towards a more peaceful and sustainable technology? Lastly, to begrudge the efforts of one person (no matter how small) who wants to make a difference, to me, is a bit sad. The programs I mentioned in the article not only benefit the climate, but improve the lives of people who otherwise have very limited opportunities. As I said to someone earlier, people have said “too hard” about many issues in the past (women’s rights, black rights, poverty, etc.) but it’s still very important that we address them, or at least don’t detract from people who are trying to help. In any logical analysis, the risks of not acting on climate change far outweigh the negatives of taking action. Thanks for the comment – while I don’t agree with the process of your argument I do appreciate the civility. I’ve had some really awful emails and comments this past week. Brian O, Please stop this nonsense. This is not about belief this is about factually established information. Ramsey! Epic! I am going to “make” all my @Ouishare mates read it. Way to go!!! Honestly one of the first in regard to this topic (carbon footprints and websites) I’ve ever seen. Great job bringing it to light for us. A real eye-opener. Many people don’t realize that the minerals needed to create computers, phones, other personal devices are strip mined. These are non-renewable resources that are being extracted in the crudest most damaging ways to the Earth. It’s great that people say they are reading on kindles and pdfs, but what they don’t realize is that trees are a renewable resource when farmed properly which so many are these days — AND that the paper is recyclable. So it actually leaves a lighter footprint in many ways than a new phone or computer. You have touched the tip of the iceberg! Congrats on this post! Some years ago I worked in environmental remediation (of toxic waste on land and sea) and to see a post like this warms my heart! Huh…. all this time I thought my dream of quitting my day job making my commute from my bed to the computer would help the environment. Guess not after reading this insanely detailed post. Seriously, awesome stuff! I do agree that we need to do more and I enjoyed the extra tips outside of the website area (decrease meat consumption and such). Keep up this kind of topics in your blog. Those that make a difference in people’s lives. This is a huge thing but our little efforts will surely come a long way. Cheers! A very well written and interesting post Ramsay, while I do not agree with much of the C02 debate and the fact that ‘global warming’ has become a political rather than a scientific debate I strongly support efforts to reduce pollution and harm from human industry. We can all only seek to learn and discuss more about this issue, resisting the temptation to become dogmatic and myopic about it – great stuff! Hi Michael. If only the wider global debate was as open as this one. While I don’t agree with your stance, I wish more people could discuss it like this as I think it would probably lead to better compromises. Thank you. It’s an honor to be able to call you a friend. Working in online marketing for a nonprofit focusing on the reduction of carbon emissions I am so happy you wrote this amazing article about this issue. Thanks for giving this topic a bit more attention in our industry by making a positive example – without blaming or shaming anyone. Love working in an industry with such thoughtful and inspiring people. Thanks Sebastian! I’m glad you enjoyed it. Really appreciate the support. An important message here that I was somehow not recognizing. I have been thinking, “wow, how green I have been the past 5 years not commuting to a job outside my home every day.” But my websites are part of the problem. Brilliant work, Ramsay. I’ve been vegan for 30+ yrs (quit meat 41+ yrs ago). I grow or buy organic, compost, try to eat mostly raw and probiotic rich foods: to me, staying healthy means less of a burden on the public purse and the internal/external environment. But I’m not as enviro-savvy as I thought I was. There’s always something new to learn, hey? This post is so different from usual blogging posts and yet so informative and an eye-opener. Thanks Ramsay for taking this initiative. Our all little efforts can make a big change in people’s lives. Wow, I had no idea! Thanks Ramsey. I will definitely share. Had no clue in hell that websites through servers and the Cloud made such a massive carbon footprint. Now I do. As for living green, you betcha I’ll tweet this post to my 44,000 followers and share it on Google Plus too. As for my laptop I have a lightweight Chromebook. Although I go entirely off of the Cloud now I actually store very little on Google Drive, OneDrive, DropBox and the like. I’ve had only 3 laptops over my 8 year online career. All base modesl. This one’s refurbished. Me and wifey are minimalists. We travel a bunch but do the slow bit, flying once every 3 to 4 months if that. Most flights are super short. And when we settle in, we primarily walk to get around, almost everywhere, leading to very little consumption of fossil fuels on our part. No cars of course for us. We own 2 laptops, 2 tablets, suitcases, backpacks, 2 week’s worth of clothes and wallets with some cards. That’s it. Literally. We enjoy experiences, and take them with us everywhere, and leave the stuff for other folks. To each their own. I’d rather see the world versus trying to own it. Wifey’s been vegetarian for over a decade. I eat meat once to 3 times a month, if that. We’re also intermittant fasters too, spending 14 to 16 hours fasting daily, and consuming a pretty dang low number of calories at that. So we’re doing our best to make the world greener through our lifestyle choices, eliminating most stuff from our lives, using simple but totally functioning, solid laptops and tablets, and going from Point A to Point B by walking most places, once we get settled in with public transportation. Thanks for being one of the good guys! Another option is to have content on your blog which aids other people to reduce their on environmental impact. I started using blogging tools to create a public-transport website for my city in 2009. Lots of consultants had told the city that this was needed, but they kept not doing anything about it. So I did. (Having a global recession and so very few IT jobs going at the time helped!) I cannot measure how much carbon has been saved because people now catch the bus more readily, because they can find basic information like where to catch it, what bus routes serve their neighbourhood etc – but I know it’s had a positive impact. I think it’s really important that we consider the impact our websites have on the environment. Too often than not people completely forget about the health of the planet when setting up an online business. Thanks so much for spreading this important message. Nice post, but unfortunately I don’t think that the solutions you’ve presented make any difference. The change should take place at a deeper level. What you propose is like extinguishing the fire with a spoon. Hi AB. Thanks for your comment. I politely and respectfully completely disagree. This issue needs to be solved at all levels – from big government down to small individual decisions to consume less. Unfortunately, the “it won’t make a difference” argument has been used for centuries to stifle progress. It happened with slavery, women’s rights, poverty, etc. and now it’s happening with climate change. What we can see, however, is that the small-scale projects that make an effort and spread awareness do have an impact over time. I think every voice is vital. Great article ! Thank’s. I like how you provide options that anyone can implement. I’m definitely interested in adopting this practice myself, thanks for working to improve your own footprint and others’ as well! Passing this on to friends for sure. There is something new that i learn everytime when i open your blog. I didn’t think that my site was creating pollution – but yes the option suggested is great and even if one is not interested in paying a company to plant trees, one can start by planting it at his/her house.